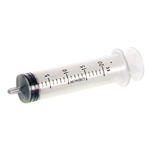 1cc/ml tuberculin sterile syringe (without needle) comes with a Leur slip tip that slips onto the needle hub for leak-free connection, and graduated measurement markings from 0.2 to 1.0cc/ml for reading accuracy and dosage precision. This single-use syringe is latex-free. It features a clear barrel with bold scale markings for visual inspection, and an integrated plunger stop to prevent the plunger from accidentally dislodging. The syringe and barrel are polypropylene (PP) material for chemical resistance, and the plunger seal is polyisoprene (IR) for good resilience and high gum tensile strength. These syringes fit with female Leur fittings including sharp needles, blunt needles, polytetrafluoroethylene (PTFE) needles, and stopcock valves. Syringes are devices used by professionals and hobbyists to inject, vacuum, sample, and dispense solutions for a wide variety of applications in the medical, dental, veterinary, biotechnology, microfluidic, and pharmaceutical industries. Allows for careful placement of materials such as adhesives, pastes, sealants, grease, etc. 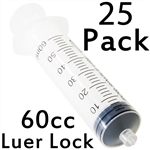 60cc/ml sterile hypodermic syringe without needle has Leur lock tips. Latex-free, clear barrel chamber with graduated scale markings from 0 to 60cc.